Project: A finished basement in St. Paul. Positives: Lots of space, newer neutral carpeting and a cable TV connection. Negatives: Too much clutter, dated paneling and exposed ductwork and plumbing. Showing a buyer as much livable space as possible is always a positive selling point. And while this basement in St. Paul boasted a lot of finished space, there were many obstacles to overcome. Dated wood paneling that accentuated the lower ceiling height drew even more negative attention to exposed ductwork and pipes. "Even empty, there were so many distractions going on down here, it was hard to see the potential," said Lori Matzke of Centerstagehome.com. "We wanted to blend the distractions into the background, giving buyers a better sense for the actual space." Excess toys and furniture were stored. Always store as much as possible to free up space. Visible square footage sells. A new cabinet hides the fusebox and exposed wiring. 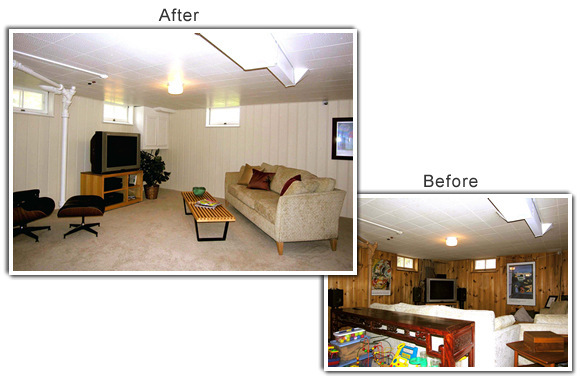 Replacing missing ceiling tiles gives the room a more finished appearance. Painting the ceiling, trim, cabinet, ductwork and pipes bright white reflects more light into the room and makes them less noticeable. Unfinished wood paneling was painted a cheery shade of off-white to brighten the space and make it feel more up-to-date. Positioning the TV set farther down the wall and angling the sofa and coffee table create a more sensible and inviting furniture arrangement. The contemporary Eames-style chair and ottoman, which had been taking up too much space in the master bedroom, rounded out the seating area. The loveseat was used to create a conversational area in another section of the basement (not shown). Matzke accessorized the room with a large basket filled with silk greenery and magazines. A sculpted ceramic bowl adds color and rust and mocha silk pillows provide texture. Tip: Positioning all of these elements slightly below the room's midlevel makes the ceilings feel higher. Putting bold artwork behind the sofa helps draw a prospective buyer's eye away from the exposed ductwork and pipes.